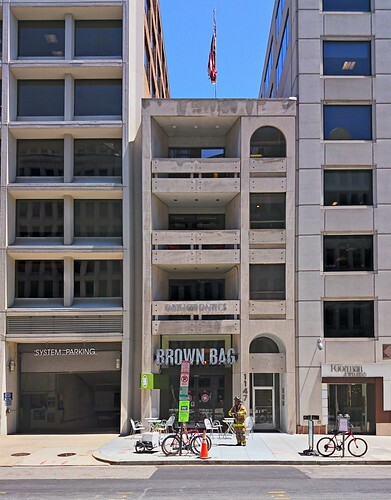 Writing “The five best Brutalist buildings in DC” required a lot of attention to definitions. The article’s less about the “best” Brutalist buildings than about examples of Brutalism that fit in well with their urban surroundings (or, in one case, rural surroundings). I love the Hirshhorn Museum’s courtyard, for instance, but it’s pretty awful towards everything around it, so it didn’t merit a mention in the article. If any of the seven buildings are “on the cusp” per Banham, the CFPB and Canadian Embassy fit in too well with the perimeter-block typology of the city around them — and therefore don’t quite have the cartoonishly simple standalone imageability* typical of the Brutalist sculpture-as-building. Yet both are very clear in plan and intent and have imageable elements. Perhaps the Canadian Embassy’s devalued materials make it more of a postmodern spin on Erickson’s own Brutalism, but that’s a fun tautology. Commenters have disputed Dulles Airport’s inclusion, perhaps because they actually like it and want to reserve “Brutalism” for stuff they don’t like. Yet it easily meets Banham’s definition, and furthermore celebrates a vast expanse of béton brut like no other local structure. – Sometimes, even a clumsy Brutalist building can be better integrated into the urban fabric through changes to landscaping and circulation; such repairs are underway at Boston’s City Hall. – Over in supposedly kinder Ottawa, Brutalism was the house style for many cultural institutions, and insensitive changes to these buildings are proving controversial. – The BBC is currently airing a two-part series on Brutalism. – Some very highly expressive concrete canopies are on view now in an exhibit at the Art Museum of the Americas about the work of Félix Candela, whose soaring but paper-thin concrete shells enclosed everything from bandshells to cathedrals throughout Mexico. This entry was posted in arts & media, urban design. Bookmark the permalink. Not sure what that name-calling means or achieves, particularly since I’m not an architect. As I wrote, Dulles easily fits Banham’s tripartite definition.